Cranky Carls Farm, started in 2011, with Cranky Carl Kidwell, and farmerette in training Gretchen Clarke and of course, Miles and Cody, Gretchen’s two sons. Completely sustainable family run farming, was the main concept behind the farm. 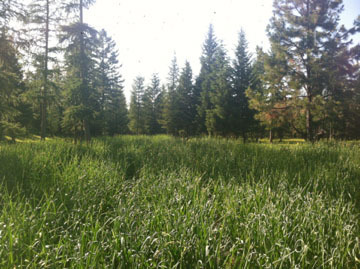 The rye grass pastures feed the cows and the pigs. The cow’s milk feeds the pigs and chickens. 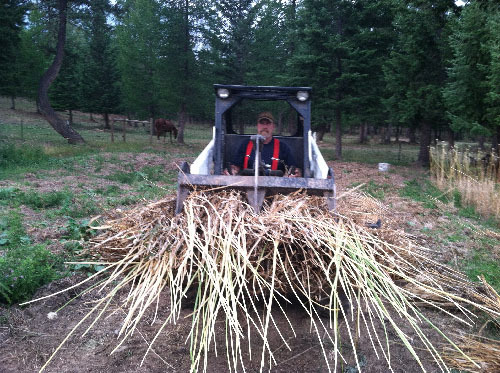 The manure from chickens, pigs, and cows, feed the organically grown garlic, veggies, and berries. The meat and produce feeds the farmers. 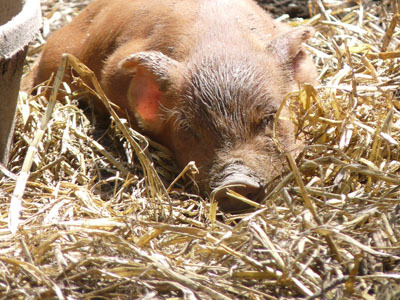 A Red Wattle Piglet, enjoying a warm day in Spring! 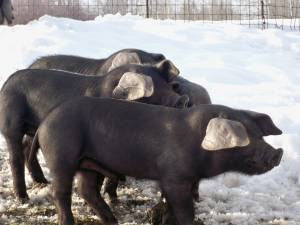 Large Black Hogs piglets learning about snow! Focusing on Non-Gmo naturally raised meat and produce, Cranky Carl’s Farm does not use any chemical fertilizers, weed control, or gmo feed. “We feed only Non-Gmo Alfalfa, ground & sprouted barley” during the winter months, and try to have most of the animals out on pasture during the spring and summer months. No Soy or corn of any kind is used in any feed. 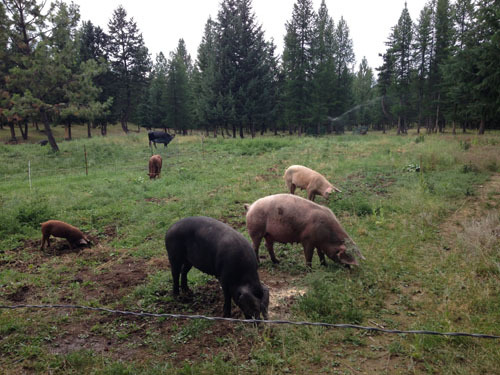 “Our focus is on completely natural slow growth meats and naturally grown produce.” All the animal manure is composted and recirculated back into the land. Nothing goes to waist around the place. Of course the garlic is extra spicey due to the natual Hog manure! 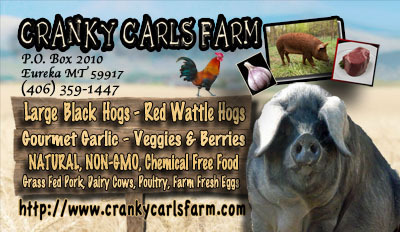 Cranky Carl’s focuses on excellent taste and humane farming practices, offering crate-free farrowing and free range chickens, hogs raised in large open pastures rather than pens, as an example. Either Carl or Gretchen assist every mother at farrowing time, day or night. Gretchen has spent many a night out laying in the straw with a new mother. She says it make a mother calm having someone with them, especially new moms. Gretchen feels this not only helps with mortality rate, but allows wonderful bonding between animal and farmer. 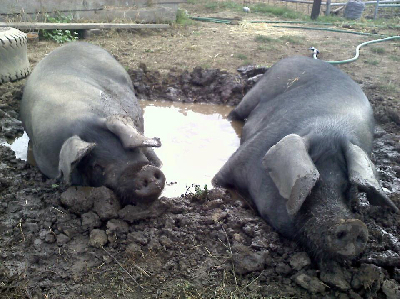 Gretchen and Carl often wonder out to the pigs and sit in pasture with an after work tottie. 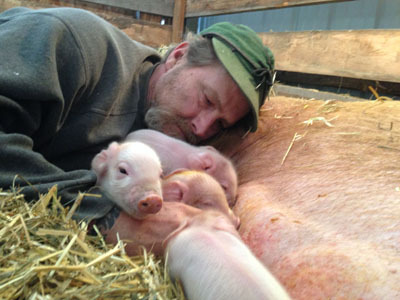 They love being with the large docile pigs, who insist on belly rubs and back scratches. 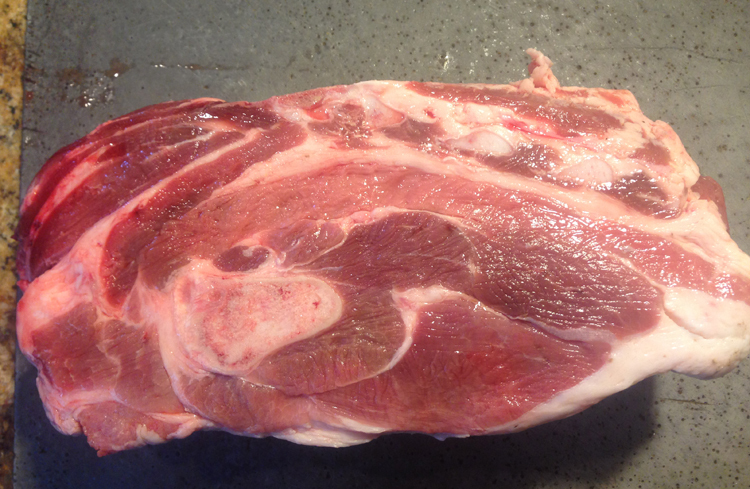 Typical Pork Shoulder from one of our Large Black Hogs. 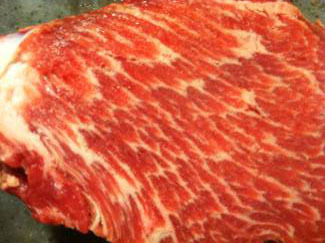 Micro marbled pork that self bastes when cooking. When health issues put beef on the no-dinner list, raising pork came to mind. 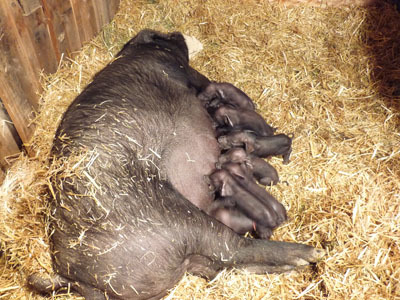 After much investigation on breeds and livestock options, Rare Heritage Pasture Hogs were chosen. Large Black Hogs, known for their unusually large size, fantastic docile personalities, and unsurpassed tasting bacon and Red Wattle Hogs, known for their bright red micro marble gourmet flavored pork were chosen. They tell their customers to try the meat, saying “It’s the best pork you’ll ever have!”, and their customer call back and say, “You were right, I’ve never knew pork could taste so Good!” They keep coming back for more. Cranky Carls Farm offers a wide variety of heathly naturally raised food; farm fresh eggs, pork, berries, poulty, dairy and more to come as the farm grows. They also welcome phone calls, (406) 291-1262 and farm visits if you can catch them, as they are usually out doing what farmers do….….FARMING! We are working towards getting all pigs on pasture. 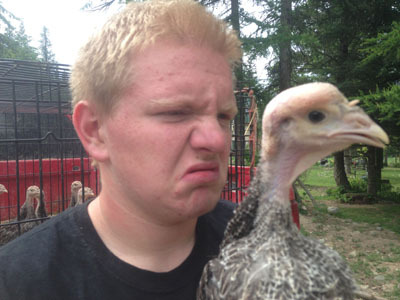 Who is the Ugliest here? 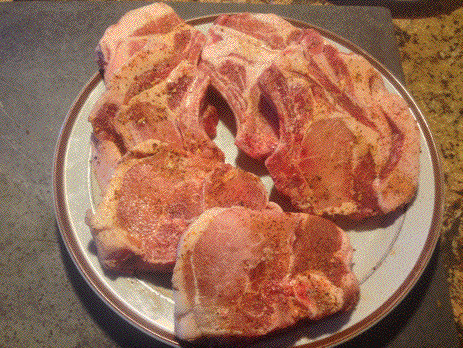 We started with the Garlic, and have added the Heritage hogs, Berries, Poulty, Eggs and Veggies. 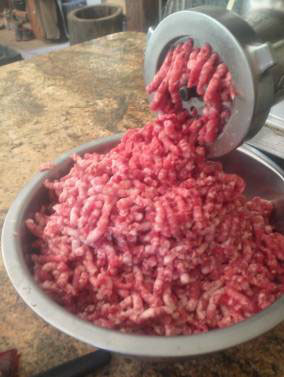 We sell our pork and food locally as well as cross country. Please visit each of our pages to check out what whe do and what we are all about.